Darlin's this post has been inspired by the colors of Nautica at Home Paint. 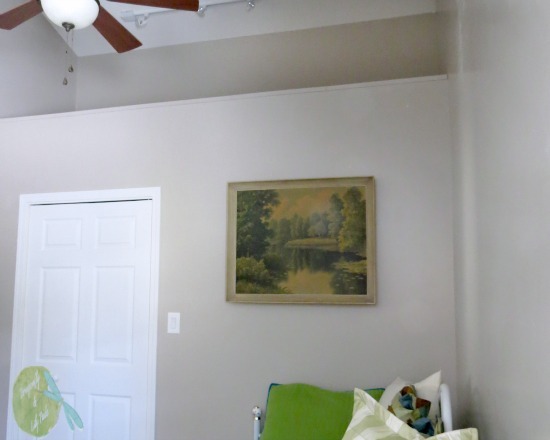 They provided me with a fabulous print of a picture I took this summer and a +Menards gift certificate to cover paint, rollers, tape, and tarps. 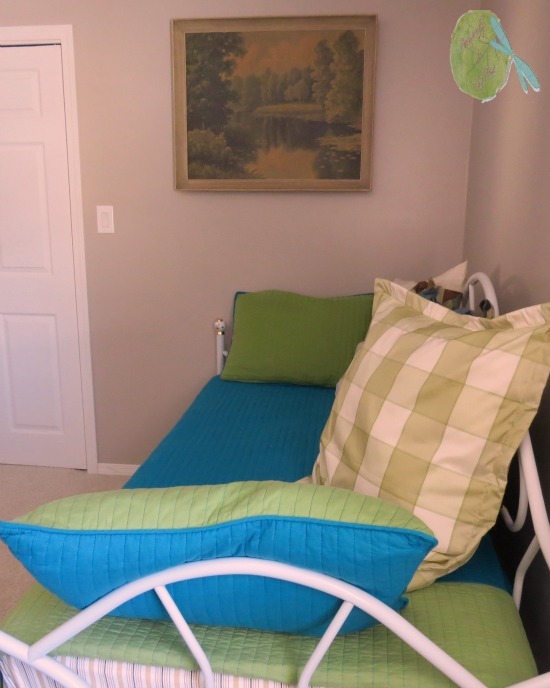 Here are the colors Prince Charming and I chose for our son's room at our lake home. Nautica makes it so easy their designers choose colors they picked from the picture to create a color palette for us. We considered them while making our final selections. Stone Washed was our final choice for the main walls in an eggshell finish. The remainder of our paint colors Vessel, Dinghy, and Caspian Green are in Semi-gloss style finish to reflect light. This plain Jane is how the room looked before. 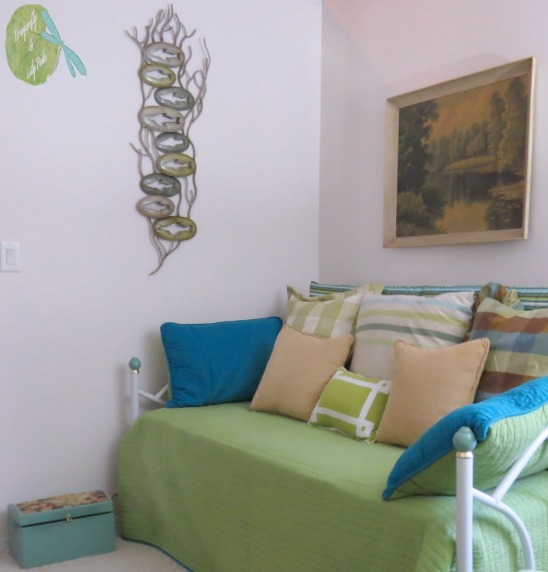 Notice the Daybed Knobs! This corner and loft are so dark the picture of the 1959 Featherlite boat inspired me to step out of the darkness. 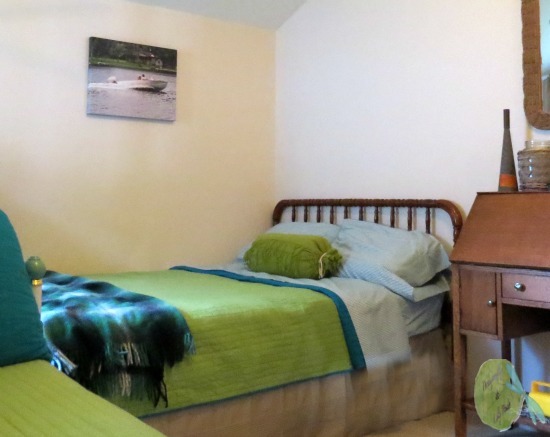 Wait until you see the after picture of this space. The bed found at the local Restore. 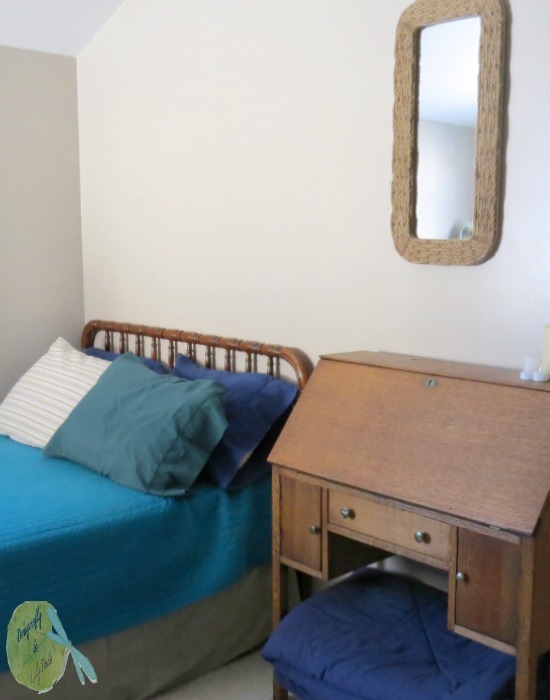 The handmade desk is all the way from Kansas City, Missouri. That is a long story. This painting was sold to me by the woman who received from her family as a wedding gift for ten dollars. The Daybed needs some flower removal. Now we have the reasons for changing some of these layers. It is time to show you how in less than two days Prince Charming and I painted this room with Stone Wash Nautica Eggshell Paint. I bought a couple items from +Menards that I think will surprise you. The two tan pillows in this picture along with a deck chair cushion on the back of the daybed were all at the South Haven, MI Store. Do you see the Caspian Green in this picture used twice? I sanded the flowered knobs, taped them with frog painters tape and peeled off the tape. If I knew it would be that easy I would have done it a long time ago. The second place in on the box in the corner of the picture bought at a Goodwill. To see the transformation this dresser made click on this link Here. Two of my favorite items in this room cost nothing. The cup came from a neighbor on who has lived on the lake for three generations. They used it to drink out of at the water pump. 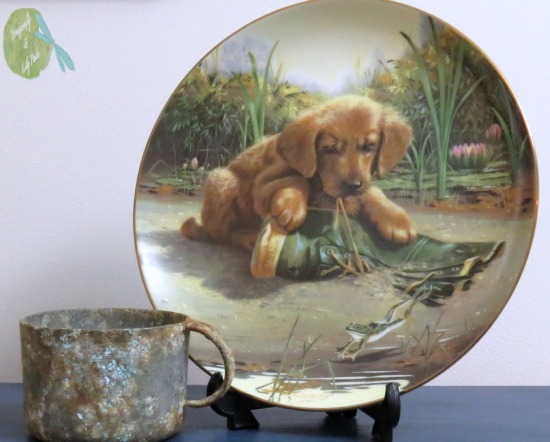 The plate my sister in law bought be at a garage sale as a surprise. The puppy looks just like my Cricket. The paint went on smoothly and the coverage was great. I will absolutely use this paint again. 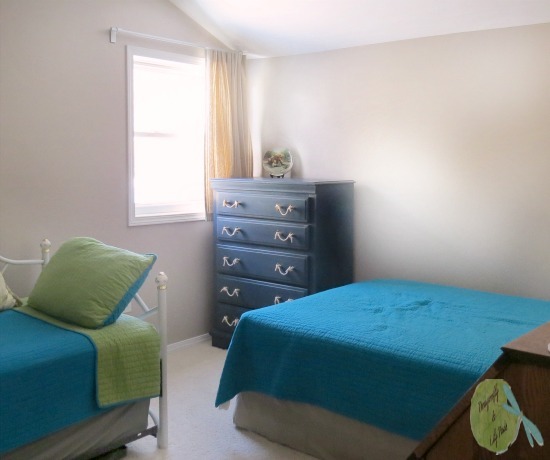 This room is now a place I am proud to have added the layers of our life into Nautica at Home Paint inspired room. The Lake sign on this wall was found for under $5.00 at +Menards too. Nautica Semi-Gloss Vessel, Dinghy, and Caspian Green created a reflective surface which certainly brightened the darkest space. This part of the room has quite a bit of energy inspired by the picture below. The walls are the colors of the boat. The floor of the loft is inspired by the colors of nature in the picture. 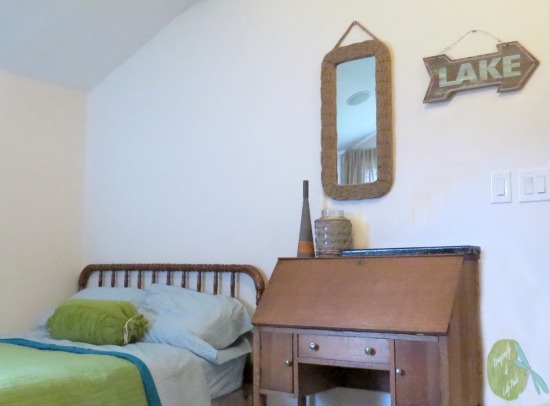 The old Fog Horn on the desk and the wool plaid blanket at the foot of the bed add more layers to the room. Prince Charming purchased them as a present for me on my birthday at +Randolph Street Market Chicago. Nautica At Home Paint truly inspired this room for our son's, from the maiden voyage of our 1959 boat in a lake filled with the energy of many people who have spent time at the lake over the years. The picture started and finished the room off perfectly. 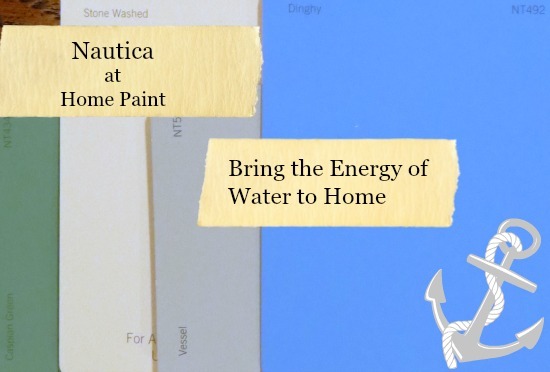 Nautica At Home Paint has amazing colors. 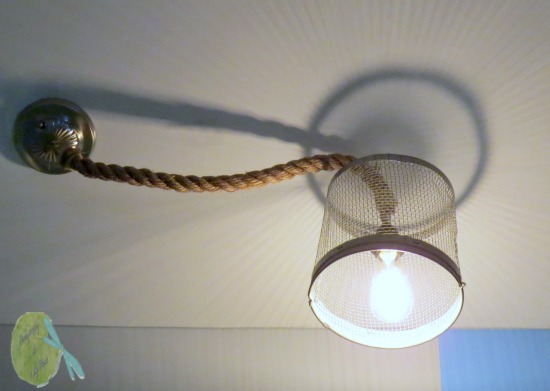 I chose to make the stripes of the boat in the loft. 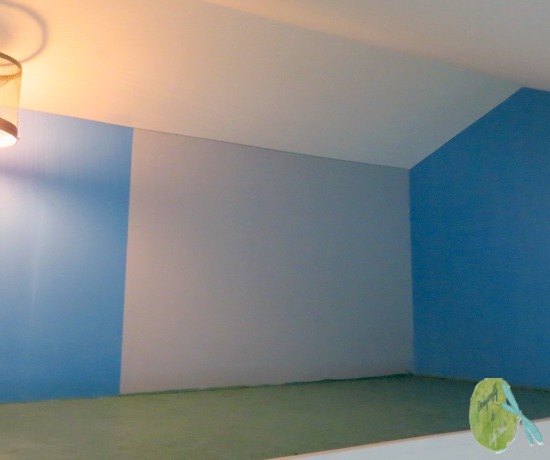 The paint went on smoothly and the stripes came out crisp and clean with the use of Frog tape. You know what is even better a sponsored post? You having a chance to win $100.00 Menards Gift Card from Nautica At Home. Thank you so much for pinning my design. 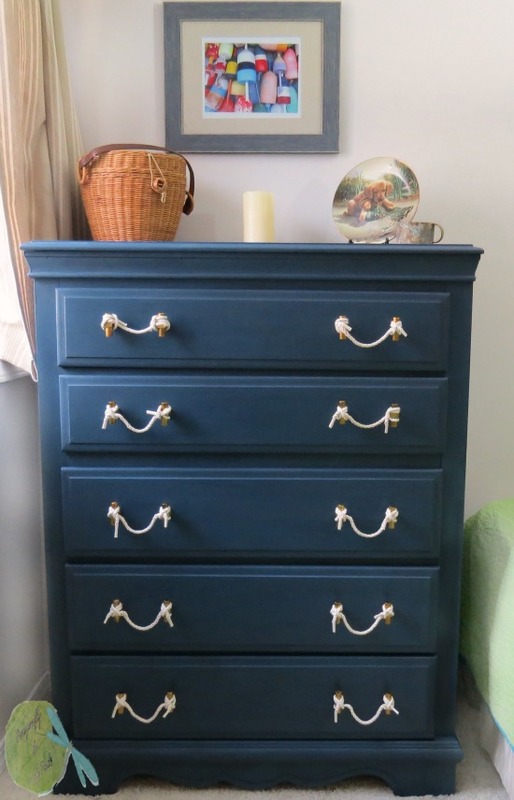 I had fun with the Dresser pulls and my nautical themed room.